Escape is not often a word that comes to mind when in Rome. The buzz of vespas, the intimacy of neighborhoods, the chitchat of cabdrivers, fellow bus passengers, newspaper and fruit vendors, and café owners, and labyrinthine streets make the fit into Roman life seamless, with no desire to leave. Except in July, a month that perfectly imitates a Las Vegas summer, minus the dancing pirates and the misters spritzing cool water every 15 minutes, add in more cars, more people, and less space. In short, Rome is a Dantean inferno. The seven circles of July hell come to life as: Exterior Museum Lines, Interior Museum Crowds, Transportation Strikes, The Metro, Hot Scooter Seats and Sweaty Helmets, Non-stop Traffic, and Waiting for the Bus, in no order of importance. Place yourself in any of these situations, on any day in July and you will reconsider why you are here, physically and metaphysically. It is at this point that you mustn’t give in. A truly Roman escape is like an espresso in the morning—quick, completely satisfying, and easy to find. It requires no car nor train, no beach nor mountain, only your sandals, perhaps a bus pass, and two words: Cocomero and Grattachecca, Roman slang for watermelon and shaved iced. The end of June marks the beginning of watermelon season, cocomero vendors sprout up on neighborhood corners as anonymous warriors fighting July with one thick slice of watermelon at a time. 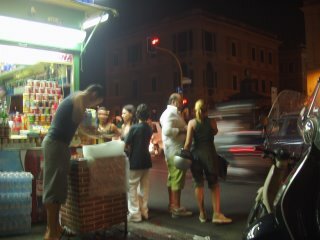 On the south side of the Circo Massimo (viale Aventino) is my favorite cocomero guy, appointed “best” for his expertise in fruit hacking and the amazing social location. For the price of 1 euro, I enjoy a juicy slice while watching grandparents share with their grandchildren, the evening opera crowd partake in a watermelon digestif after Aida at the Terme di Caracalla, or late night motor scooter trysts of cocomero-to-go, with St. Peter’s Dome and the Palatine Hill as a backdrop. If the cocomero guys are my summertime soldiers, the Grattachecche are old, stoic generals, biding their time quietly during the year until the middle of June, when the heat makes its first attack and they are once again called to action. There are few of these old-fashioned shaved ice stands in Rome, and I am lucky to live near L’Emporio di Grattachecca, the emporium of shaved iced, at the southwest corner of Ponte Umberto I (Piazza Navona). The Emporio is disguised as a refreshment stand where bottles of colored syrup (mint, lemon, cherry, etc), hide themselves among the soda, water bottles and potato chip cans. Every so often, a young man hauls a large chunk of ice to a faux brick pedestal, and then forces it forward and backward across a grater. That is the give-away to my secret oasis. The Ice Grater. For two euro, he will mix whatever concoction I deem perfect (lately its been lemon cherry). And then I will sit in my red plastic chair, watching non-stop traffic which no longer bothers me because I have Roman snow in my hands, in the middle of July.